Vitamin & mineral supplement liquid with malt extract for infants and young children. Purified Water, Raw Cane Sugar, Malt Extract (from Barley), Vitamin C (Ascorbic Acid), Ferric Ammonium Citrate, Thickening Agent: Xanthan Gum, Zinc Sulphate, Preservative: Potassium Sorbate, Olive Oil, Vitamin E (DL-Alpha Tocopheryl Acetate), Niacin (as Nicotinamide), Pantothenic Acid (D-Panthenol), Acidity Regulators: Citric Acid (as Monohydrate) & Sodium Hydroxide, Vitamin B2 (Riboflavin 5-Phosphate Sodium), Thiamin (Vitamin B1 as Hydrochloride), Vitamin B6 (Pyridoxine HCl), Copper Sulphate, Vitamin A Palmitate (Anti-Oxidant: DL-Alpha Tocopherol), Folic Acid (as Pteroylmonoglutamic Acid), Vitamin D3 (Cholecalciferol), Vitamin B12 (Cyanocobalamin). Allergy Advice: For allergens, including cereals containing gluten,see ingredients in bold. For children aged 3 - 4 years the amount may be administered directly from spoon if desired. Food supplements must not replace a varied balanced diet and a healthy lifestyle. As with other food supplements, consult doctor or pharmacist before use if your child is under medical supervision, has epilepsy, haemochromatosis, suffers from food allergies, or is allergic to any of the ingredients. Allergy Advice: For allergens, see ingredients in bold. Any spillage should be wiped off the skin. Those with particular sensitivity may in rare cases experience mild temporary redness of the skin; if this occurs, as a precaution you should discontinue further use. Avoid contact with clothing and fabrics which may stain. Store below 25°C in a dry place, out of sight and reach of children. To open bottle, press & turn child proof cap. Keep tightly closed. Store in fridge after opening and use within 8 to 10 weeks. How much liquid does Wellbaby Multi-vitamin Liquid contain? 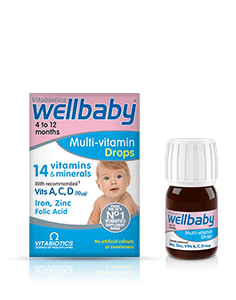 How and when should Wellbaby Multi-vitamin Liquid be taken? Are there any undesired effects whilst taking Wellbaby Multi-vitamin Liquid? 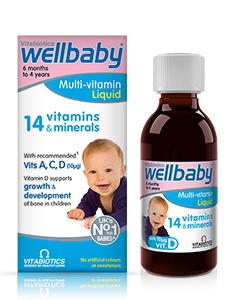 Is Wellbaby Multi-vitamin Liquid recommended with any other Vitabiotics products? Is Wellbaby Multi-vitamin Liquid suitable for vegetarians? Has Wellbaby Multi-vitamin Liquid been tested on animals? Government surveys have indicated that some infants are not getting enough of certain nutrients such as iron, zinc, vitamin A and vitamin D. Many children old enough to be on solid food are not eating the recommended 5 portions of fruit and vegetables a day and so may not be getting all of the vital nutrients that their bodies need for long term health and development. Some foods may have a lower than expected nutritional content and be low in certain micronutrients as a result of several factors including modern farming practices, the lengthy storage of ‘fresh’ food before it is sold in some shops and over cooking which can cause certain nutrients to breakdown. It is important to promote a healthy diet and lifestyle in younger children as the starting point of good health and encourage positive eating and exercise habits for later in life. Wellbaby Multi-vitamin Liquid contains 150ml per bottle, enough for 30 days at the recommended dose of 5 ml/ day. INFANTS (6 months to 4 years): 5ml daily (1 teaspoonful), mixed in your baby's usual milk or water. If desired, for infants 3 to 4 years, this may be administered directly from the spoon. It is important to ensure that your child does not take more than the recommended amount. If desired Wellbaby Multi-vitamin Liquid may be given immediately before feeding so any residual liquid is washed off teeth and gums. Wellbaby Multi-vitamin Liquid has no known side-effects when taken as directed. Do not exceed the recommended daily intake. In case of overdose, seek medical advice immediately. As with all supplementation, seek professional advice before using if your child is under medical supervision or suffers from any food allergies. Yes, Wellbaby Multi-vitamin Liquid is suitable for vegetarians. 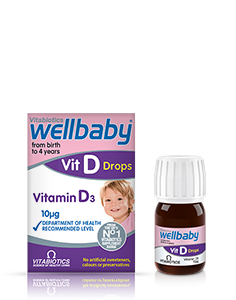 Please note Wellbaby Multi-vitamin Liquid is not suitable for vegans due to the vitamin D (cholecalciferol) used in the product, which is sourced from natural lanolin from sheep's wool. No. Like all products in the Vitabiotics range Wellbaby Multi-vitamin Liquid has not been tested on animals.